So many thanks to those of you who kept us company through our VERY LONG Livestream! We’ve also provided a blank speech bubble version of this page by demand. Don’t ever say we never gave you anything. Ahaha vegan homeopathic kindergarten. XD Dear lord Mikey’s mom is a nut. I love her! Do they seriously have those? Mike’s last word bubble is exactly what I was thinking. 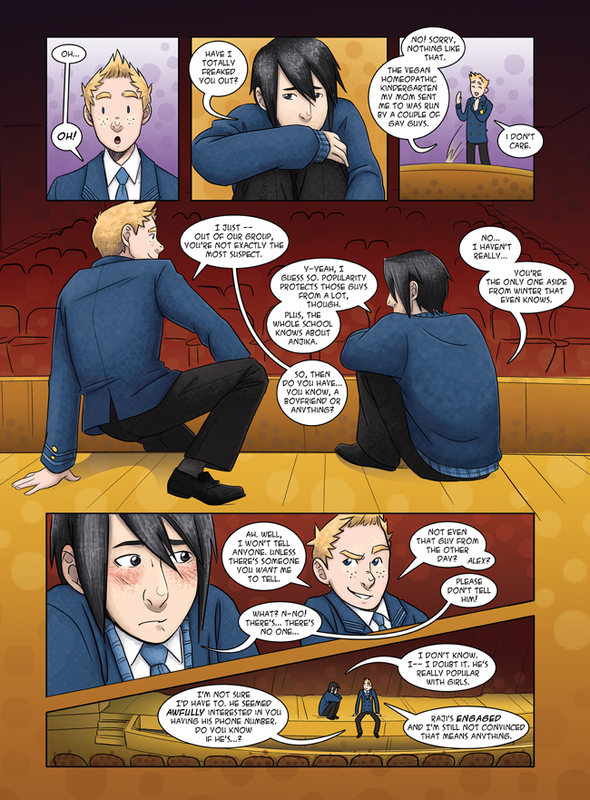 XD Funny enough, I reread this the other day and I had totally forgotten the point where Alex asked if Mike and Yuki were dating, he seemed a bit relieved to hear that they weren’t…. SEE I TOLD YA MIKE’S A GREAT FRIEND. <3 T.T so cute. I want Mike as a best friend. YAY!!!!!!!!!!!!!!!! i love it, mike totally has to encourage yuki to go after alex!!! i can imagine all the hijinks! and yes, i love mike’s last line! perfect, and just what i have been feeling in regards to raji! Really good job on their facial expressions this one! I think I love Yuki more now. He’s just so cute when he’s being, well, emotional. Omg Mike and Yuki as bros4life makes me so dang happy. Look at them. They are adorable. Especially Yuki. And Yuki’s blush. And Mike! Look at you! You are not as oblivious as we think you are! 😀 Totally picked up on that UST with Yuki and Alex! Well done! How much will it cost to get a mini Yuki in my mailbox right now! And, well, go Yuki, go ! Don’t let your fears and other people’s judgement be obstacles to what you are. That’s why I’d like to be able to tell… But we all know that there’s a huge gap between professing this kind of rules and appplying them in real life, unfortunately. So… Do your best, Yuki! I’m pretty sure this is the first time anyone’s said ‘the g word’, love Yuki insaaaanely. YES!!! The moment wasn’t interrupted!! XD And Mike’s last line on this page is the best. YUKI. MIKE. GET TO THE KISSING. IMMEDIATELY. I hate to just be repeating what everyone else is already saying, but Mike really impressed me here. As did Yuki. What he just did took a serious amount of courage, especially since he hasn’t know Mike very long. Serious props to both of them. Also, am I the only AlexYuki fan here? Anyone? I’m positive our Raj is bisexual, possibly pansexual. He seems like the type that wouldn’t want to keep the wonder that is he from a whole gender. I’m wanting Mike/Yuki now. I know it’s Alex/Yuki, and hey, that’s cute~ but for reason, way later, I want there to be some serious Mike-falling-for-Yuki-and-being-completely-confused-about-it sequence going on. Unf, I got a kink here. Oh good, Mike’s not as oblivious as I thought. This is getting really interesting! Your name made me have a Gleek moment. JSYK. Oh Mike, you have just earned SO MANY cool points right now. Now go find Alex and lock him in a closet with Yuki. *shoos* Get to it! just picked this comic up, gotta say I’m really enjoying it! the art and story are both really good, and I really enjoy how the main characters interact with each other 🙂 can’t wait to see more! Ahhh i love the uncertain sexuality! In real life it’s not all “yep im gay” or “yep im bi” and I’m glad to see that portrayed in one of my favorite webcomics! I also want to say that I love how some things are colored in dots. It’s so cool. My camp fire is down to its final embers, and I’m entirely out of marshmallows. I do so hope the next page gets posted soon! Oh Yuki. You’ll get your man, you just wait. Also, kudo’s for Mike being the most well-adjusted apple-pie teen ever, if you catch my drift. Go Mike! Being suddenly un-oblivious! !